Without further ado, a giant list of places we ate and drank in New Orleans! And some of the things I/we ate and drank! A lot of these places are not in the French Quarter, but if you like to walk on vacation (or if you grab a cab, or course) you will be able to get to many of them without too much trouble. Several are nearby one another in Marigny, and others are on or very near to Frenchman Street. Bacchanal Wine – A wine shop that’s grown into a full-on venue, with a huge and beautiful back patio with live music, and an upstairs bar. Great food and cocktails, too. We didn’t stay long, but I could see myself hanging out there for an evening. The Bleeding Heart (housemade strawberry liqueur, ginger, basil, Hellfire Shrub) was a good start to vacation. The Franklin – One of those kinda-sorta upscale places that becomes a neighborhood haunt. We had some amazing cocktails here. The bartender was friendly and very, very knowledgeable. I had the Desmond (smooth ambler old scout bourbon, cappelletti, averna amaro, orange bitters) and some crostini with burrata and tomato jam. Handsome and our friend enjoyed the Kentucky Rifleman (rittenhouse rye, old scout bourbon, caffe moka, orange bitters, black walnut bitters), which was so well-balanced, and some tasty fried oysters. Mimi’s in the Marigny – One of our host’s favorite locals. Pool table downstairs, gypsy swing quartet upstairs. Nothing fancy, just a cool place to spend some time. Bar Tonique – A great cocktail bar where people mostly seemed to order off their list, which I certainly advise. We got seats at the big bar, and were able to watch the bartenders crank out Sazeracs and other delicious concoctions. Drinks (on the whole tab, not just in my hand) included: Sazerac, Frenchman’s Dark & Stormy, Blanch Dubois, Champange Cocktail. Click through for details. Elizabeth’s – A fun and casual place for a super delicious brunch. You will not be disappointed if you get out here. Eats included: Redneck Eggs (Fried green Tomatoes with Poached Eggs and Hollandaise, and grits), a rabbit braise over biscuits, and a gigantic burrito that used to be called the stonerito. 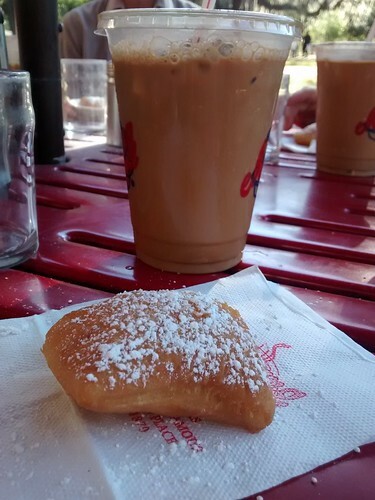 Morning Call – Beignets and Cafe au Lait in City Park. Delightful! These were a bit lighter than the Cafe du Monde beignets. Oxalis – A good bet for a nicer dinner if you don’t want the full fine dining experience. The food was delicious, and the beer and cocktail menus were great. We were lucky enough to get seats in the courtyard, which I highly recommend if you can swing it. We got the cheese plate and the charcuterie plate, and I got the local tomato salad (more buratta) and the cioppino. Cane & Table – We just had drinks and dessert here, but the food we saw going by looked really good. Handsome wanted to come back and sit at the bar to chat up the bartenders (it’s billed as a “proto-tiki bar,”) but we didn’t get a chance. The salted caramel pudding was delicious. Sadly I do not remember what I got to drink, I just remember that it was tart. Pagoda Cafe – A tiny, awesome spot. Only a few seats, all outside. The breakfast tacos were delicious. This appears to be a place where the local bicycle crowd hangs out, and it seemed like there were a lot of regulars. Also, there was someone selling fresh bread out of the back of their station wagon, with a very ingenious sign attached to the top of the hatch. Right on. 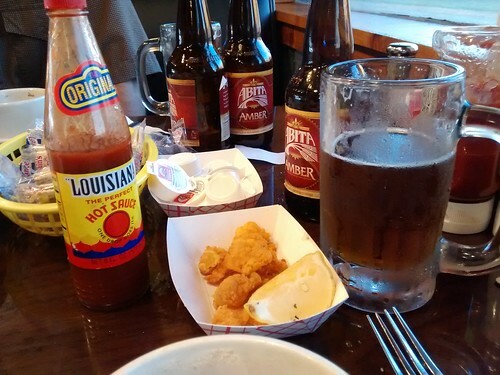 Nancy’s Seafood Shack – A good bet for a meal after your alligator adventure in Houma. We wound up here because the Jolly Inn was closed. I think our waitress was a little confused at how we ordered – basically all the fried appetizers, no entrees. And we didn’t place the whole order at once. Whatever! Another round of ambers! Do try the fried gator bites, they were good. Fried seafood lunch at Nancy’s. Fried gator bites not pictured (click through, it’s the next photo). Cafe Fleur de Lis – A great cafe for brunch in the French Quarter – very close to our hotel to boot. And tasty eggs benedict! Cafe du Monde – Beignets and Cafe au Lait, of course. We went in the afternoon, when there was no line. It’s a little confusing – basically you sit down at any abandoned table, and then someone comes by to clear the table and find out how many coffees and orders of beignets you want. Then they bring them to you, and you pay – and tip! – all at once. FYI. Anyway, this was tasty and I’m glad we stopped in. There was a dude playing saxophone on the sidewalk next to the covered patio, so it was pretty perfect. Juan’s Flying Burrito – Between the Garden District and the French Quarter. This is the Holy Frijoles of NOLA, but with better food, and a not-quite-as-good house margarita. (So…maybe that’s a bad comparison? Oh well.) Anyway, get the jerk nachos, you will not be disappointed. Tiki Tolteca – A tiki bar above a taqueria, with a very cool atmosphere. It had a great menu with a mix of classic tiki drinks and tiki drinks created by the bartenders. This is where Handsome discovered Moai gummies and anesthetic amazonian flowers, among other things. 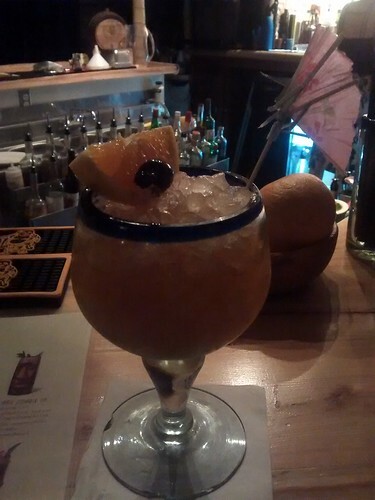 Hurricane at Tiki Tolteca. I SEE WHAT YOU DID THERE. Lafitte’s Blacksmith Shop – Our Bourbon Street stop. We got the slushies, of which they had two kinds, both purple. We let our n00b show and asked the difference, and were told, “they’re pretty much the same thing.” Basically a giant freeze pop squeezed into a cup, with some vodka added. Meh. Get one to split. Anyway the atmosphere was neat, it’s old (built in the 1720’s) and candlelit and there was a big group hanging out with the piano player. Aunt Tiki’s (Yelp) – Divey home-away-from-home of a friend. An excellent and no-nonsense place to stop into on Frenchman Street, and just hang out a while. I got the sense you could either ignore everyone there or make a new friend for life. Note: this isn’t actually a tiki bar, or even a cocktail bar, really. It is simply a bar, in the best sense of the word. Cafe Envie – A coffeeshop with a great breakfast menu and a low key vibe. I had a thing with brie, yum. Port of Call – We stopped in thinking around lunch-ish as we recognized the name as a place a friend told us we shoudl go. But, then I was just not into the idea of a huge burger and/or baked potato, which was most of the menu. That said, they looked good, I just couldn’t do it at the moment. So, we had drinks and planned a strategy and moved on. Cafe Rose Nicaud – A great casual lunch spot, where I had a delicious salad that was more my speed that day. Also very clearly a place where you could just hang out for a while and watch the world go by. Restaurant August – Our lovely fine dining, white tablecloth, super upscale dinner on the last night. Amazing and well worth the price. The service was impeccable, but not condescending. The food was outstanding (I’m still thinking about the bruleed goat cheese). Handsome asked a question about something on the menu, and it was answered with such an evocative description that I asked our server about the entree I wanted, just to hear her talk about it. If you have a special occasion to celebrate (such as “we are on vacation,”) I highly recommend this!